Nassau, Bahamas—The Bahamas ranks 49 out of 162 countries and territories included in the Economic Freedom of the World: 2018 Annual Report, released today by The Nassau Institute in conjunction with Canada’s Fraser Institute. Hong Kong and Singapore again top the index, continuing their streak as 1st and 2nd respectively. New Zealand, Switzerland, Ireland, the United States, Georgia, Mauritius, the United Kingdom, Australia and Canada (tied for 10th) round out the top 10. The 2018 report was prepared by James Gwartney, Florida State University; Robert A. Lawson and Ryan Murphy of Southern Methodist University; and Joshua Hall, West Virginia University. It’s based on data from 2016 (the most recent year of available comparable data) and measures the economic freedom (levels of personal choice, ability to enter markets, security of privately owned property, rule of law, etc.) by analysing the policies and institutions of 162 countries and territories. The 10 lowest-ranked countries are Sudan, Guinea-Bissau, Angola, Central African Republic, Republic of Congo, Syria, Algeria, Argentina, Libya and last-place Venezuela. Some despotic countries such as North Korea and Cuba can’t be ranked due to lack of data. According to research in top peer-reviewed academic journals, people living in countries with high levels of economic freedom enjoy greater prosperity, more political and civil liberties, and longer lives. For example, countries in the top quartile (25 per cent) of economic freedom (such as the U.K., Japan and Ireland) had an average per-capita income of US$40,376 in 2016 compared to US$5,649 for the bottom quartile countries (such as Venezuela, Iran and Zimbabwe). And life expectancy is 79.5 years in the top quartile of countries compared to 64.4 years in the bottom quartile. “Where people are free to pursue their own opportunities and make their own choices, they lead more prosperous, happier and healthier lives,” said Fred McMahon, Dr. Michael A. Walker Research Chair in Economic Freedom with the Fraser Institute. The Fraser Institute produces the annual Economic Freedom of the World report in cooperation with the Economic Freedom Network, a group of independent research and educational institutes in nearly 100 countries and territories. It’s the world’s premier measurement of economic freedom, measuring and ranking countries in five areas: size of government, legal structure and security of property rights, access to sound money, freedom to trade internationally and regulation of credit, labour and business. Hong King tops the rankings with scores of; Size of government: 8.59; Legal system and property rights: 7.9; Access to sound money: 9.57; Freedom to trade internationally: 9.32; Regulation of credit, labour and business: 9.44, goals for The Bahamas to work toward. 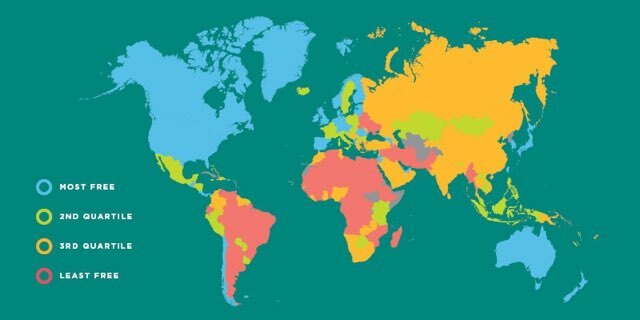 Economic Freedom of the World measures the degree to which the policies and institutions of countries support economic freedom. This year’s publication ranks 162 countries and territories. The report also updates data in earlier reports in instances where data has been revised.